Captain Jack Sparrow is an insatiable human being, cutthroat and ragged, with such a calculated and intricate magnetism that even those who openly detest his existence can’t help but be fascinated by him. By the standards of movie pirates, he is also like few of his kind: an elusive buccaneer who still manages to connect with a conscience on occasion. Most others are prepared to slit countless throats and betray any advisor possible in the pursuit of riches galore, but Sparrow knows when to be sympathetic, when to abandon fool-hearted ideas, and when to except defeat, even if only because he lacks the guts to be a dedicated example of his kind. There is, furthermore, little trouble in an audience routing for him; despite all the shady dealings he may or may not be a part of on the open seas, we know there is usually an ulterior motive cleverly hidden beneath. 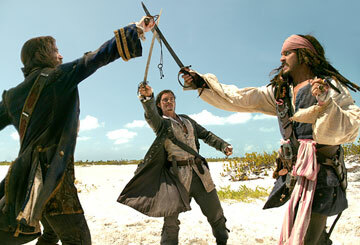 Example: an early scene in “Pirates of the Caribbean: Dead Man’s Chest,” in which Jack is confronted by Davy Jones, captain of the legendary Flying Dutchman, and told that he must collect 100 souls in order to save his own life. The audience knows he has no intention of carrying out such a plan, although that does not prevent him from initially agreeing to the bargain (or making the effort to come up with the cost). Never trust a pirate to keep a promise, they say, but also never assume that he won’t have a few cards hidden up his sleeve, either. There are ulterior motives, secret quests and vague traces of humanity running rampant through this sequel to the 2003 live-action Disney blockbuster, a movie that behaves very much like you would expect it to, except in a more enriching, tolerable and likable manner than you would expect. Though I was not one of the legions of adoring fans of “Pirates of the Caribbean: The Curse of the Black Pearl,” I appreciated it for at least having the enthusiasm to do things you would not ordinarily expect of a pirate movie, even if those traits left some of us feeling exhausted in the end. This new picture is not unlike watching the first, except now the pace is better, the action is not flooding the screen every two seconds, and characters seem more like evolved concepts rather than background distractions. Director Gore Verbinski, who has helmed both projects, can take solace in knowing that he realizes the potential of his premise this time. This is a better movie than the first, easily, and one that you can be engaged by from both a visual and narrative perspective without feeling like you’re being dragged through a tug of war in the process. The story – or more appropriately, the newest fraction of it – begins when Will Turner (Orlando Bloom) and Elizabeth Swann (Keira Knightley), the engaged love birds who assisted Captain Sparrow escape execution in the first feature, are arrested for treason and sentenced to death for their part in the pirate’s escape. Under the authority of Lord Beckett (Tom Hollander), the new governmental authority over the Caribbean isles, Turner strikes a deal with his captor that will, if accomplished, spare the lives of he and his fiancée: he must track down Sparrow and retrieve his most prized possession (what that is, I will not reveal, as it becomes an important tool in the evolution of the story arc). To what purpose Beckett needs it, no one initially understands; what is provided, at least, is enough of an implication to suggest that it has much to do with the Lord’s desire to abolish the existence of pirates and force the survivors to find different vocations in the new world. Lucky for the new world, someone like Jack Sparrow would never settle down into the mechanics of the ordinary private citizen. Good news for the audience, at least. 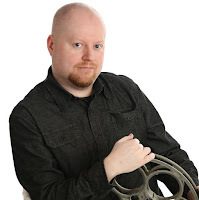 The camera sets up the premise and proceeds directly to him, sending his weary and tired crew on a mission for some sort of key, which he suggests leads to, what else, the traditional pirate’s desire: endless riches, preferably of the shiny kind. We know there is more involved (as there always is), but the plot doesn’t want us to know the specifics yet; instead, it brings about a bizarre twist in which Jack is visited by his former comrade Bootstrap Bill (Stellan Skarsgard), who has been living an immortal life of servitude to the infamous Davy Jones (Bill Nighy). We learn from their conversations that Sparrow’s ownership of the Black Pearl comes from a deal he once struck with Jones, but now that deal is about to expire. Old Davy is ready to collect the debt he is owed, and he will use anything – including a giant hydra-like sea monster that is famous for swallowing whole ships on the open sea – to get what he wants (in this case, Jack’s own soul). And so begins a plot that demands, on most occasions, great attention to specifics and developments, as the main arc and its many subplots intertwine with one another and then unfold into an even bigger conflict (one so big that, yes, it will inevitably carry these characters through a slew of other interesting events in the now-filming third chapter of the series). The varying merit between both this and the first films, perhaps, lies in the fact that the script doesn’t bite off more than it can chew again. As fascinating as everything was in “The Black Pearl,” the simple fact remained that it was impossible to keep up with at several intervals. So is not the case now, partially because we are more familiar with the foundation, but moreso because the direction opts to take valleys rather than endless rigid mountains. The movement is more consistent. Does that come down to the fact that this is basically just a bridge between part one and part three? Intellectually, it’s a strong possibility, but unlike most middle chapters, it also doesn’t utilize every past detail to prop up everything that happens on celluloid in the present. The movie is fueled by self-awareness. If the narrative feels a bit more polished this time around, furthermore, it may be owed to the fact that the film seems to embrace its quirkiness more rather than trying to suppress it behind notions of faux plausibility. There are also great subtle references staggered throughout the material, some notable (a voodoo lady that seems directly inspired from a character from LucasArts’ “Monkey Island” adventure game series), others so slight that you would almost miss them if you weren’t seriously looking (think about where you might have heard the name “The Flying Dutchman” before). As time goes on, in fact, the implication that these filmmakers are going for straightforward summer entertainment is gradually being replaced by the suggestion that it is a hodgepodge of various pop culture references. We are certainly given great amounts of entertainment required of such a vehicle – a swordfight involving a mill wheel is a triumph of skill and adrenaline – but it is little tiny things like an homage here and there that are beginning to resonate more. I, of course, make it sound as if the movie is without flaws, of which it certainly is not. For starters, the picture is far too long, a trait that looks to plague the series from beginning to end. Certainly this is not material convoluted enough to require more than just two hours to play out successfully; why drag out something that can be easily wrapped in fewer minutes? My guess is that the director is so in love with his characters and their adventures, he has no desire to unfasten their leashes. This ultimately leads to a resolution that feels less like actual cliffhanger and more like an abrupt and incomplete double climax. Other films that rush to closing credits just as a jolt is delivered (such as “The Matrix Reloaded”) are wise to leave us with the right emotions; here, there is no time to react to the final ten seconds because the script hasn’t had a chance to determine how it wants us to feel about it at that precise instant before leaving us stranded. It’s an awkward and perplexing situation, an ending that knows the mechanics but not the outlook of its situation. Is any of this going to matter to the average movie-goer, though? Not in the least. And thus it does not make much of a difference in this critique, because these are rather small quibbles in context to a feature filled with genuine excitement and zeal. The picture looks great, feels accomplished, and genuinely delivers everything you hope it would. “Pirates of the Caribbean: Dead Man’s Chest” may be a darn good popcorn flick in the eyes of most, but it’s also a blockbuster that isn’t afraid to challenge the audience a little with something more than just intricate action scenes or witty dialogue exchanges. It has a brain that even the wisest of pirates would be proud of.